Annan Athletic deservedly lifted the points at a windswept Galabank to stun table toppers Elgin City on Saturday, a result which could reignite Annan’s faltering challenge for the top spot. This was a match between the team with the best form over the last six weeks against the team with the worst performance and for a betting man you would have been hard placed to go by Elgin City increasing their advantage at the top of the league but as so often happens in this highly competitive league form often goes out the window. Jago celebrates his debut goal. 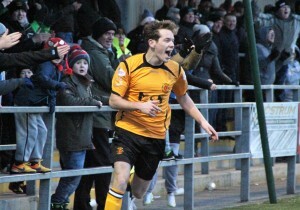 Annan boss Jim Chapman was hindered with his selection, being without the injured Peter Weatherson, Steven Black and Steven Swinglehurst but the squad was boosted by the signing of Ben Jago on loan from Tranmere Rovers till the end of the season and it was Jago who made himself an instant favourite with the Annan fans when his 82nd minute goal gave Annan the two goal cushion after Elgin has worked their way back into the match a couple of minutes before hand. Elgin started promisingly and in the 6th minute Annan had a bit of good fortune when Mark Mackenzie’s goal was chalked offside after the dangerous Daniel Moore skipped past the challenge of Watson down the left to pick out MacKenzie who finished clinically but was marginally offside. It was an early warning for Annan. Archie McPhee was booked for a calculated foul on Rabin Omar in the 11th minute. Jordan Hart pulled off a superb point blank save to deny Daniel Moore in the 16th minute as the visitors went searching for the opening goal. Daniel Moore was once again in menacing form down the right in the 21st minute when his dangerous cross to the centre of the Annan defence caused all sorts of problems but the danger was cleared. Annan almost broke the deadlock in the 24th minute when Gilfillan’s well flighted ball over the top of the Elgin defence picked out Flynn who’s well struck effort was well superbly saved by Hurst. Annan were starting to pose a few problems for the visitors and as the game approached the half hour mark a good move down the right involving Flynn and Omar created the space for Sloan but the shot was weak and did not test Hurst and an opportunity was lost. The danger signs were becoming more apparent for the visitors and in the 34th minute the deadlock was broken when Josh Todd opened the scoring when he latched on to Rabin Omar’s defence splitting pass which sent Todd clear on goal and the Annan striker calmly dispatched the ball under keeper Mark Hurst and into the empty net. Todd was at the heart of Annan’s second goal 2 minutes later when he burst down the right past Cooper to finish with a low deliberate ball into the path of Matty Flynn who side footed into the net form 8 yards. The loss of two goals in 2 minutes was a bitter blow to Elgin and minutes later the Elgin goal survived a close call when Flynn’s effort went narrowly over the cross bar. It was a real purple patch for Annan and in the 41st minute they had the ball in the net again when Flynn combined with Omar who’s shot was net-bound but Todd who was in an offside position tapped it into the net only to have the goal chalked offside. Elgin would have been glad to here the half time whistle and with the advantage of the wind in their favour they were in with a real chance of overcoming Annan’s slender lead but within seconds of the start of the second half Annan had added a third goal. It was a well worked goal which once again exposed the visitors down the left, Jordan Morton who was dangerous all afternoon once again sent in a glorious ball which found Flynn steaming in at the back post to finish by slamming the ball into the net from inside the six yard box. A minute later an identical move once again saw Morton whip in a dangerous ball across the face of the Elgin goal with Flynn only just failing to connect with the cross. Annan had started the second half with a bang and in the 55th minute they almost increased their lead again when in a bizzare moment Rabin Omars shot looked to be sailing over the bar until the wind caught it and the effort landed on the top of the bar with the keeper struggling to get back into position. Annan had started positively and in the 58th minute they were denied a blatant penalty when Flynn was upended trying to get on to the end of a Josh Todd cross. Elgin overcame their nervous start to the second half and Dylan Easton was denied a goal by the cross bar in the 60th minute and at the other end Rabin Omar’s delicate chip shot went narrowly over the bar. Craig Gunn’s 62nd minute shot went right into Hart’s arms but a minute later the Annan keeper was pulling the ball out of the net when substitute Kyle McLeod picked up a loose ball to rifle in a low shot which beat Hart all ends up, it was just the tonic that Elgin needed and minutes later Easton set up Gunn but the shot went narrowly over the bar. In the 70th minute Dylan Easton was given a straight red card for a reckless tackle on Jordan Morton it was a further setback for the League Leaders but 10 minutes later they were back in the game after they won a free kick wide on the right and Archie McPhee’s well struck free kick somehow managed to find the back of the net from 30 yards past Gilfillan and Hart. Elgin had barely time to celebrate the goal when Annan struck again after Ben Jago powered in at the back post to head home Jordan Morton’s corner kick after Morton had made a penetrating run in from the left and finishing with a well struck shot which Hurst superbly saved for a corner. The goal was the final nail in the coffin for the determined Elgin team and the victory sets Annan up for their Fourth Round Scottish Cup tie against Morton at Galabank next Saturday. ANNAN ATHLETIC: Jordan Hart, Ryan McStay ( B Jago 65 min), Bryan Gillfillan, Martin McNiff, Peter Watson, Steven Sloan, Ryan Finnie, Mathew Flynn ( Smart Osadolor ), Rabin Omar, Josh Todd ,Jordan Morton. SUBS NOT USED: Blair Currie GK , Greig Macdonald, Stuart McColm, Scott Norman, Liam Park. ELGIN CITY :Mark Hurst, Mathew Cooper (s off 70 min), Archie McPhee, Daryl McHardy, Mark Nicholson, Thomas Rielly , Mark Mackenzie (Conor McLaren 69 min), Brian Cameron, Craig Gunn, Dylan Easton , Daniel Moore (Kyle McLeod 57 min). SUBS NOT USED: Jordan Halsman, Robbie Bruce, Stewart Black GK. REFEREE: Kevin Graham . ASSISTANTS Michael Banks and Stuart Luke.